(Bloomberg) -- U.K. retailers experienced their customary post-Black Friday slump in December, Office for National Statistics figures showed Friday. The volume of goods sold in stores and online fell a larger-than-forecast 0.9 percent from November, when they surged 1.3 percent. Sales excluding auto fuel dropped 1.3 percent, the most since May 2017. Sales of household goods fell 2.3 percent and other stores such as opticians and flooring firms saw sales drop 6.3 percent, more than offsetting gains at department stores and clothing retailers. Non-food sales overall fell 2.3 percent; food sales rose 0.2 percent. Fuel retailers were boosted by a sharp fall in oil prices during the month, with sales rising 2.6 percent. 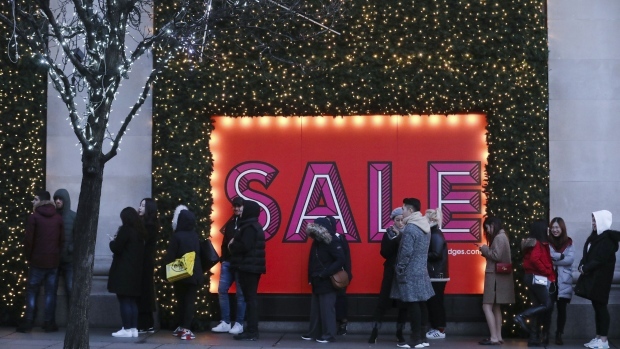 Statisticians have struggled to adjust for the Black Friday effect, with Christmas purchases increasingly being brought forward to November to take advantage of heavy discounts. Sales over the fourth quarter as a whole fell 0.2 percent, compared with a heatwave-boosted 1.4 percent in the third quarter. The decline cuts GDP growth by 0.01 percentage point. Sales in 2018 rose 2.7 percent, up from 2 percent in 2017 but below the peak of 4.7 percent in 2016, the year of the Brexit referendum. High Street trading remains tough as the Brexit crisis saps consumer confidence. Retail stocks slumped in the fourth quarter and 2019 began with warnings from firms including Halfords and John Lewis. In value terms, sales fell 0.1 percent in the fourth quarter, the first decline since the end of 2015. The survey, which includes Cyber Monday, was carried out between Nov. 25 and Dec. 29. Black Friday fell on Nov. 23, with promotions getting under way well before then. The average non-seasonally adjusted weekly value of sales in December was 9.4 billion pounds ($12.2 billion), 2.1 percent higher than a year earlier. Online sales accounted for 20 percent of the total last month.